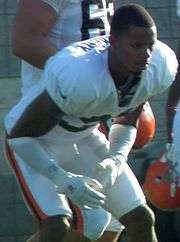 Dockery in Cleveland Browns training camp in July 2012. James Dockery (born November 9, 1988) is an American football cornerback who is currently a free agent. He was signed by the Browns as an undrafted free agent in 2011. He played college football for Oregon State University where he earned Pac-10 Conference honorable mention. He graduated from Palm Desert High School in Palm Desert, California, where he grew up. ↑ "James Dockery". Oregon State Athletics.